The BlackBerry Z10 is shaping up like a decent smartphone that is relevant in every aspect, and the web browsing experience is clearly one of them. That's what becomes evident from this video comparing the BlackBerry 10 web browser with Safari on the iPhone, Internet Explorer on a Windows Phone powered Samsung Ativ Odyssey, and the stock web browser on the Samsung Galaxy Note II running Android. During their testing of the BlackBerry Z10, the guys at MobileBurn ran several browser benchmarks on all devices, the popular Browsermark being one of them. The best performer turned out to be BlackBerry 10 and its WebKit-based browser, which scored an impressive 2382 points – a tad more than the Galaxy Note II, which finished in second place. But in addition to the aforementioned benchmark tests, there's a lot more going on in the video below. Several browsing features are being demonstrated, such as the Reader Mode, which clears the page from non-essential content leaving texts and images only for easier reading. You can also see the web browser in action during real-life testing while browsing some relatively heavy, media-rich pages. Check it out below and don't hesitate to drop a comment if you like what you see. Huh? Dual core unknown chips beat quad core exynos? Are you joking? After thinking about the scores....that is good for a dual core phone to match a quad core one in this test. Just like in the PC world...it was never a clear cut choice between dual and quad core. I think only in the last 2 years did quad cores start posting better results doing things dual core were better at. I know its one reason why I was never interested in a quad core until last year. First of all it's not unknown, its a Qualcomm Snapdragon chipset which is possibly the S4. Also, its not just the hardware involved, software matters greatly too whether it'll fast, slow of mediocre. Yes, the number of transistors and the clock speed indicates and The power of the processor and not the number of cores! first Intel CPU had 2,300 transistors. Intel Sandy Bridge Core i7 has 2,270,000,000 transistors . An browser benchmark cannot say anything about the power. the score of google chrome on a core i3 desktop can still be better than the score of firefox on a core i7 desktop. We cannot say anything with these useless bencjmarking, please bring the them on the same platform for a true competition. It seems gloomy compared to Android or Windows Phone browsing. 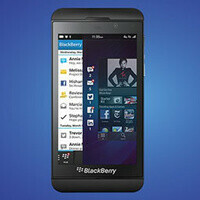 BB Z10 screen looks more yellowish than others! They should have improoved that! People can say the same for Samsung's blue-ish hue on its displays. Why do people think that more cores = more power? LOL Wake up idiots! The number of cores don't even tell half of the story!! Hahahhahaha :D I know but Not Everyone got this. Bulldozer is a good example to vs an i5. i5 has a much faster per core speed and it beats out the bulldozer in most applications even though it has half the cores and lower clock speed. Don't judge anybody as an "idiot" if you haven't prove you are superior than others. An browser benchmark cannot say anything about the power. the score of google chrome on a core i3 desktop can still be better than the score of firefox on a core i7 desktop. We cannot say anything with these useless bencjmarking, please bring the them on the same platform for a true competition. Were the hell is nikolas oliver? I want him here commenting s**t like RIM =Rip....thanks to the company now officially called BLACKBERRY. Seems pretty well organized for thumb swipes! Looks very similar to Dolphin Browser. Whatever the case is with the browser....I think its safe to say its better than what they had before.